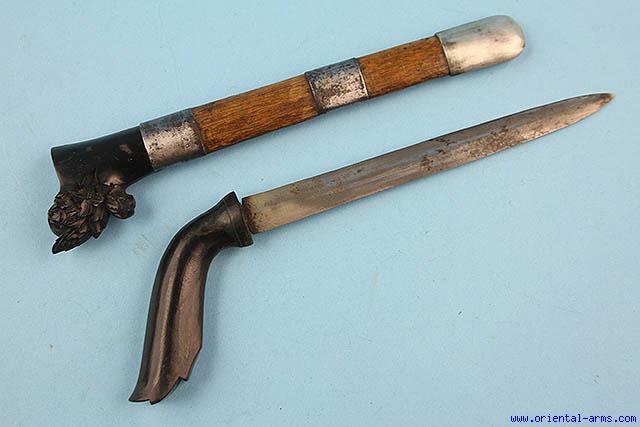 The Badek (or Badik) is a knife / short sword from Java, Indonesia. It is characterized by its single edge blade with straight back, up-curving edge, and the pistol grip shape handle. This one has a very unusual spear shaped double edge blade 7 inches long. Horn handle and carved scabbard mouth. Iron and silver bands on the scabbard. Total length (in scabbard) 12 inches. Very good plus condition.